I’m happy to say that the current Deadpool title has continued to improve. One of my main concerns about that first volume was a weak supporting cast. The ghost of Ben Franklin still has little to do, but in Deadpool Vol. 2: Soul Hunter, both Michael the Mage and Agent Emily Preston get significant character development, making them better foils for Wade Wilson. While the main plot still takes six issues, a clever use of setting up the villain in past makes it feel like less of a stretch, and interesting subplots make the endeavor feel worthwhile. Mike Hawthorne ably takes over the main art duties from Tony Moore without any major shift in the quality or style. Helping the shift in artists is the “inventory issue” at the start of the trade done by Scott Koblish, who has since become a recurring artist on the title. Gerry Duggan and Brian Posehn put forth the idea that Deadpool did indeed exist before the '90s and even had his own title. In a perfect universe, Duggan, Posehn, and Koblish would be able to do an entire “Untold Tales of Deadpool” series, because the concept is ingenious. Val Staples’s colors really help by fading the comic with yellows and pinks and adding Ben-Day dots to make it look much older. Most of the jokes land well, especially an abrupt Fruit Pie ad parody in the middle (although since it’s Deadpool, it’s for fruit liquor). Deadpool’s fourth-wall breaking skills were in place even back then, as he references Pogs and the J.A.R.V.I.S. suit A.I. Deadpool is contracted by a demon, Vetis, to humiliate the already drunken Tony Stark and ruin Iron Man’s name. The depiction of the early '80s Michelinie and Layton/O’Neil Stark is dead-on; there’s even a tiny reference to supporting character Yvette Avril in his checkbook amidst checks for Jarvis (a $45 Christmas bonus) and Scott Lang (a grand for some ants). Unfortunately for Vetis, Deadpool’s better nature wins out, and he dons the Iron Man armor to fulfill the text of his contract with Vetis while Tony sobers up. This might seem uncharacteristically kind of Wade, but since this was theoretically created in the '80s, I could imagine Jim Shooter overruling the creative team and forcing a morally sound ending. We also find out what happened to Deadpool in the intervening years: Cable took him to the distant future. Makes sense to me. Back in the present, we deal with the fallout of the end of Dead Presidents. Agent Preston died, but her soul was placed in Deadpool’s mind, enabling her to talk to him as a conscience and even take over his voice and body at times. This starts up a subplot which will continue into further volumes about Deadpool’s past and some of the “covered-up” areas of his brain. Preston’s death also provides a goal for the title: get her into a new body before her spirit fades away ... or worse. Unfortunately, Deadpool is visited by Vetis, who wants him to kill all the people he’s given power to; in exchange, he’ll spare Michael, another of Vetis’s “clients." It’s all part of a plan for Vetis to gain enough power to overthrow Mephisto and take over Hell, since after the Iron Man fiasco, he was tortured and denigrated in the demonic ranks. The first two souls to be hunted are of an indestructible Jersey Shore reject and a fairly obvious parody of Aquaman. All of their contracts have very literal exit clauses, often about them having their powers until they “stop drawing breath." However, it really kicks into gear with the appearance of the Superior Spider-Man. A lot of people have issues with Doctor Octopus taking over Peter Parker’s body, and I’m not sure if his main series suffers for it, but so far, the guest appearances I’ve read have all been fun. Deadpool treats his team-up as a “date," complete with references to dirty fan fiction. While I can’t get the Marvel AR materials to work on my phone, the majority of them have been posted to YouTube, and the videos for issue #10 are hilarious. Together, Deadpool and Spider-Man take on “Daniel Gump," a thin spoof of a certain New York businessman who now has precognition thanks to Vetis. More accurately, they take on his army of hired goons, including the Trapster, Lady Stilt-Man and Taskmaster. You might recall that Deadpool and Taskmaster are buddies; the way he works with Deadpool to take a dive is just brilliant. The same goes for Deadpool’s dialogue with Lady Stilt-Man (a character created by Joe Kelly in another Deadpool team-up in Amazing Spider-Man). Deadpool’s last target is a shapeshifter, who causes problems by turning into attractive women and siccing other men against him. This brings Deadpool into conflict with Daredevil, including a parody of the latter’s “pink grid” radar vision showing off Deadpool’s various odors. In the end, Deadpool and friends bring down Vetis with some of their own contract logic and an impressive ploy by Michael, who gets sacrificed by Deadpool to go down into Hell and get Mephisto’s attention. His anger with Deadpool is palpable; it’s a nice change from some of his old sidekicks who would stay with him no matter what he did. One of the most interesting storyline bits is a random encounter at the end of issue #8 in which Deadpool is tranquilized and harvested for organs. This is a loose end picked up in the next trade and which will lead back into Weapon X and his origins. I’m not thrilled about another set of retcons, but I hope Duggan and Posehn have done their homework. 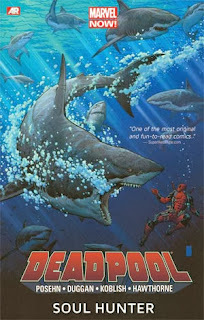 As much as I liked Deadpool Vol. 2: Soul Hunter, I was worried that Deadpool would get another reboot during the “All-New Marvel NOW!” event. Instead, Marvel is doubling down on this incarnation with an upcoming star-studded wedding, and I can’t be more excited. Next week, it’s the first part of a look back at Spider-Man’s adventures with the Fantastic Four, including his best friend, the Human Torch.